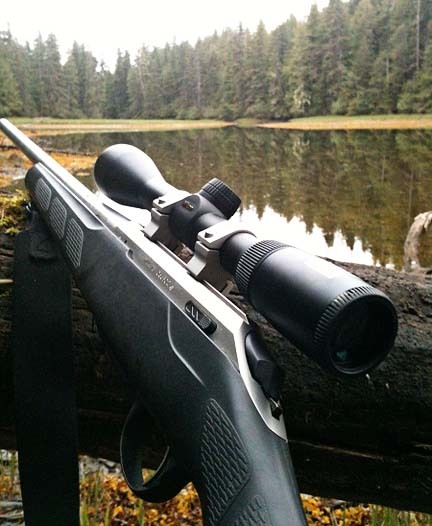 My ears were still ringing from the report of my Tikka T3 30-06, as my Dad and I huddled under a soaring Sitka spruce on the edge of the Tuxecan Passage. I’d just shot the largest, most vicious predator of my life and now he wanted to go poke it with a stick. “Are you nuts? It’s not even been three minutes.” He was next to me leaning forward with his elbows on a downed spruce trunk, peering through binoculars where we’d last seen the bear running. Though it had disappeared, he was positive my shot was true. He started to get up to go look for blood, and then it roared . . . I don’t have any brothers. Hunting in Alaska had long been a dream of mine, but actually doing it alone didn’t seem practical, safe or all that much fun. I was lamenting this fact one Christmas Eve to my mother, in that half-complaining half-joking way you can sometimes find yourself doing when you’ve had a few drinks and haven’t been on an adventure in some time. My two boys were opening presents, making messes and playing with the boxes of their new Daisy BB guns, when my dad piped up that he’d go. His hunting days had been winding down, so this was an unexpected surprise. 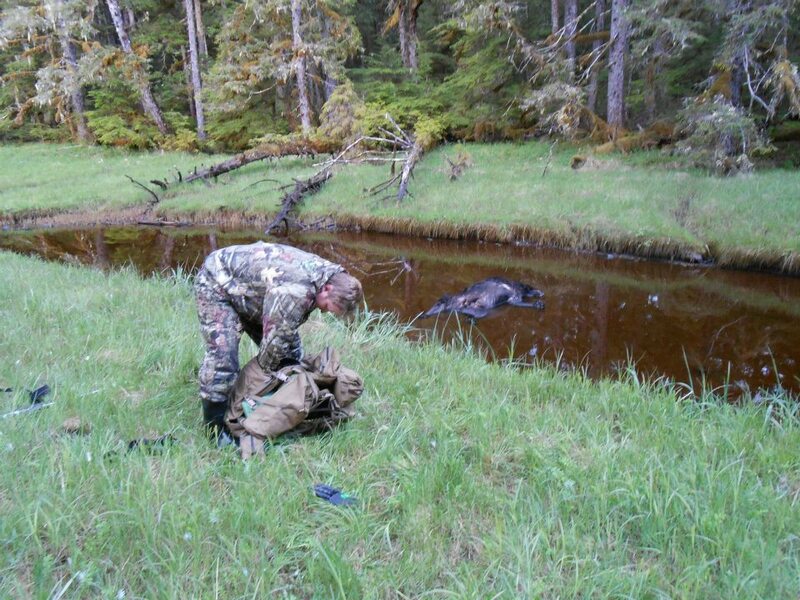 We kicked around a few different ideas for hunts, but ultimately decided on chasing black bears. We weren’t necessarily committed to Alaska, just somewhere remote. I looked for an area with the best chance of being successful without using hounds or bait. I have nothing against hounds, I was with my Dad when he took a fine bear from under the shadow of Mount Shasta in northern California. I have grown weary of hunting over bait which is the dominant method in my home state to take white tails and pigs. 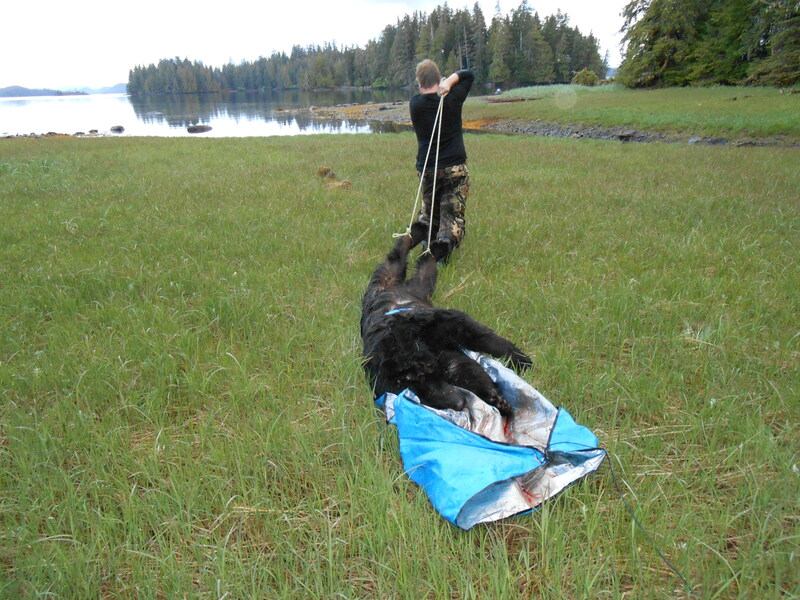 It’s a perfectly sporting method and I do it every fall with my young boys, I just preferred to hunt bears differently. 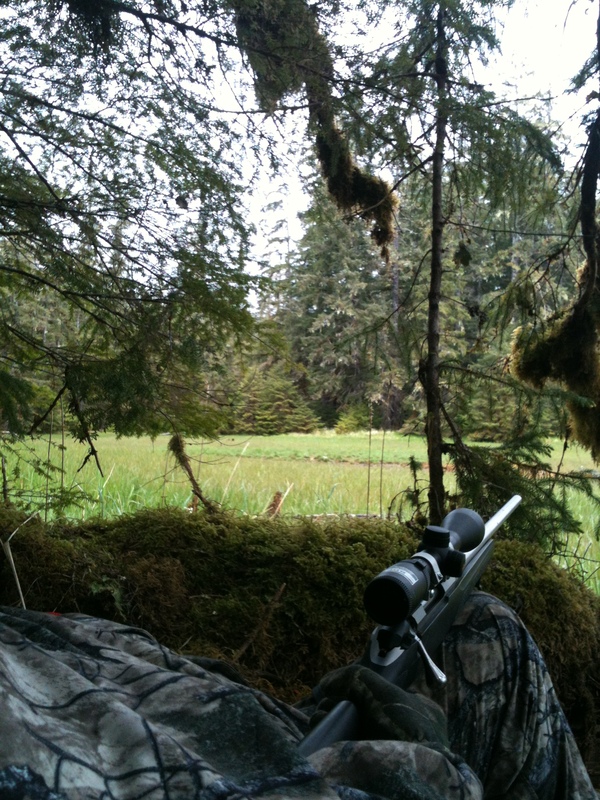 Prince of Wales Island (POW) kept being mentioned as a good destination for my preferred kind of hunt. A little bigger than Delaware, POW’s a temperate rainforest where the topography is marked by granite mountains which form deep fjords in the Pacific Ocean. Logging was the main industry and today it’s widely known as a place to catch steelhead and salmon, and find large black bears. I enjoy pulling the trigger, cleaning and eating game, so what drew me to choose POW was not the trophy reputation, but the reported 35,000 bears giving it the highest density of black bear in the world. It seemed the best chance for me to skin a bear. Sadly the modern airport, with hordes of jet-lagged, frantic and half-nauseous throngs of travelers, represents the opposite of what I am seeking when escaping to the wild. Namely rules, regulations and wretched crowds of angry people crammed into a man-made climate-controlled building. But that’s exactly where I would start my bear hunt. So, braving the morass of TSA regulations, individual airline rules, and airport quirks; I scoured the internet and made the first of several phone calls figuring out how to fly with guns and ammo, and then on the return with hopefully several hundred pounds of meat. When planning my expeditions, I imagine scenarios which will ruin a hunt. Then working backwards, I take steps to rein in Murphy and his ridiculous Law. This hunt was already complicated enough to tax the most skilled travel agent when in December, my dad gave me a call telling me he was scheduled to have his hip replaced in a week. We wouldn’t know whether he’d be able to hunt until after surgery and a few weeks into rehab. Luckily he recovered quickly. Next it was my wife’s turn to give me the unexpected news she was with child. She wouldn’t be due until October, but I would have to tread carefully lest I awaken those second trimester hormones that can make a pregnant woman not so understanding when it comes to leaving on a hunting trip. There is a primal anxiety inherent in all men before embarking on a quest, and ancient groups developed rituals, ceremonies and various chants and prayers to mitigate their unease. 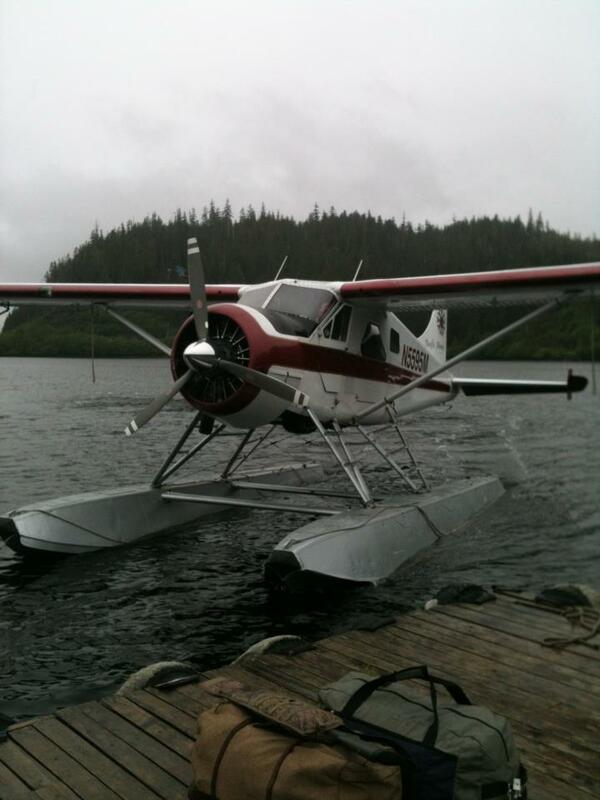 As the de Havilland Beaver taxied its way to the dock in Ketchikan I felt my pulse quicken and knees loosen with the tell-tale signs of epinephrine release saved for times of fight or flight. Appropriate enough, as I was about to board my first flight on a float plane into the wildest, most remote region of the world I’d ever visited. The closest thing to ritual I experience prior to a demanding outdoor pursuit is a lack of sleep the night before. This isn’t a side effect of the beds at the SeaTac LaQuinta, rather, it’s from the near euphoric realization of my soul’s impending reconnection to the challenges and hardships known only in the wild by those few still willing to extend themselves. 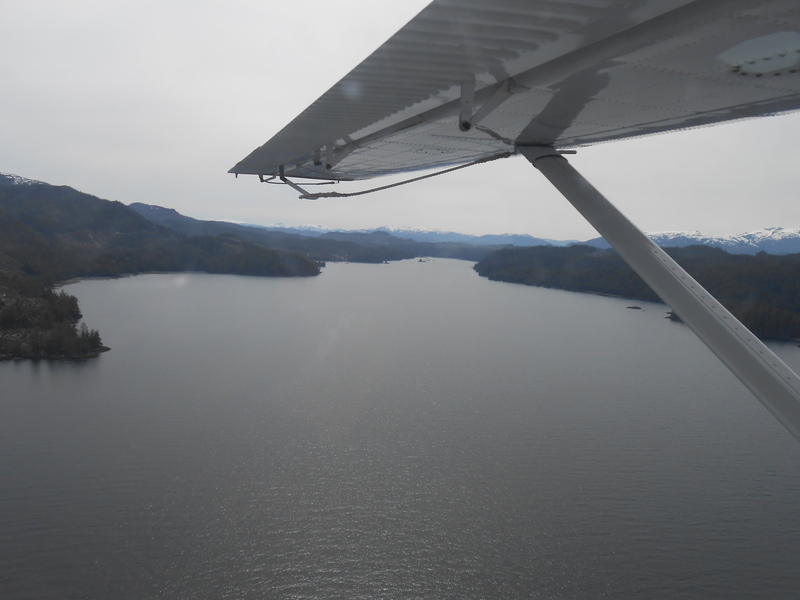 I was glad when offered hearing protection by the pilot because I didn’t want nervous chatter to distract from the stark beauty of what passed below. The contrast between where I live on the Gulf Coast Prairie in Texas and Southeast Alaska almost defies description. Where I live is flat, save where sand dunes harbor rattlesnakes and cactus next to a dull chocolate milk sea. Down below, flat land was at a premium as evergreens, boulders, and tangled masses of driftwood seemed poised to slip into the depths of a mysteriously calm yet foreboding ocean. Tidal flats, patches of emerald green meadow where freshwater met salt were probably being frequented by bears as we flew. Despite lacking extra stomachs like elk and cattle, these jade grass patches are where bears graze after arising from their winter slumber. Why black bears eat grass is kind of a mystery. One idea is that they do this to flush their systems after the long winter naps, perhaps restoring the probiotics like my more granola friends at Whole Foods insist yogurt does for humans. I don’t know. 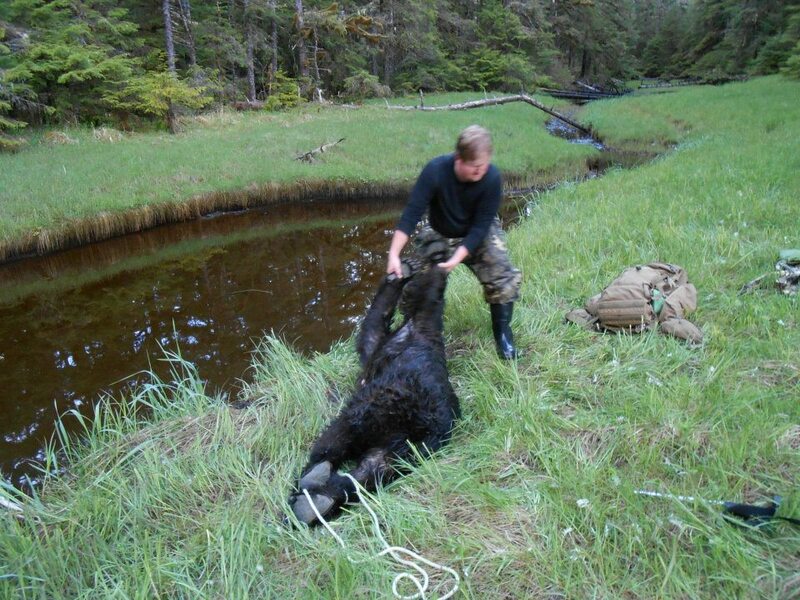 With his new hip, getting out of the Beaver showed the limits of my father’s stability and made me rethink our decision to conduct our first hunt by canoe. Even before hip replacement, getting my father to hike a great distance in the rugged mountains of Alaska to find some solitude was a dicey proposition at best, yet we remained committed to the notion our best chance at a bear lay in hunting away from the roads. Moreover, we felt any bear taken by rolling down a window wasn’t earned. By using a canoe I hoped I could avoid destroying his new hip or having to tote an oxygen tank for him. Plus, the appeal of loading a bear into a canoe in the style of Louis and Clark sounded pretty manly. Anyone who has stepped from a dock to a boat understands the stress put on your hip, and canoes accentuate it. So after loading our Mystery Ranch backpacks into the Old Towne, my Dad eased himself into the canoe with just a few strained groans and we set off down Thorne River. Fifty yards into our float we met a set of Class II rapids, and after their navigation we were consumed by silence. An exquisite series of dark lakes, really just wide spots in the river, reflected towering trees and peaks while giving off earthy smells of steelhead, moss, and muddy footprints. Bends in the river yielded fleeting glimpses of blacktail deer, while sandhill cranes squawked petulantly about our intrusion into their home. There was no trash in this river, as is so often found in the lower 48 waterways, or any other ones humans frequent. The speed of our drift was lazy, perfectly suited for glassing across the occasional meadow and distant shoreline. For stretches of the river, the only sounds were the slow drips of water into the Thorne from the paddles across our laps. Other times the sound of fleshy water slaps surprised us as we startled a pair of eager little dam builders. At last, we came upon a young sow who stood slowly to peer at the pale strangers floating past, but she was too small to bring home. 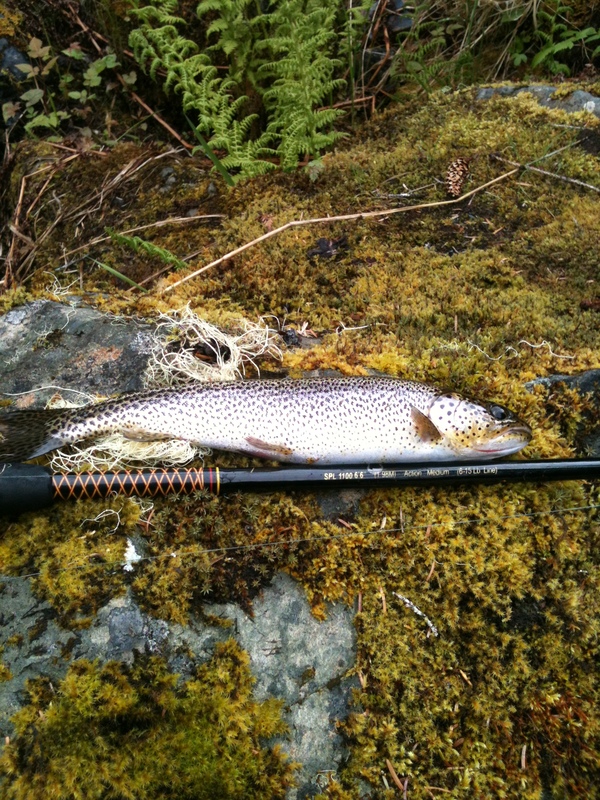 I returned and caught cutthroat after cutthroat from 10-16 inches long for an afternoon. After a quality night’s sleep, we turned our efforts to the grassy beaches, which my research suggested as our best bet. I’ve found keyboard hunting experts abound in online forums and comment sections of otherwise well penned articles. They espouse advice and insights without ever having actually done the thing in question. Nonetheless, I still dive into the murky abyss of the internet to remotely research my far away hunting destinations. Unlike fishing, I’ve found embellishment in hunting more often involves bragging about the ease of success rather than size or number of animals. For example, in high school I took up the hobby of predator hunting, and would hear and read about grown men placing a tape of a dying rabbit into the tape deck of their pickup, rolling down the windows and laying waste to coyotes and foxes. My experiences differed. So with more than a few grains of salt, I learned how to hunt coastal black bears. 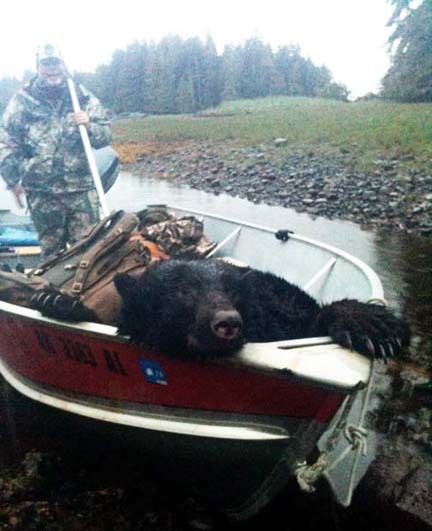 Apparently one need only possess a skiff and cruise the shorelines and, because the bear will never look seaward, hop out at convenient location and shoot said bear. Again, my experiences differed. As we shoved off from a boat launch, an army of sea otters hailed us in that anthropomorphic way otters have of looking at you while crushing shellfish on their belly. It’s not unlike looking at a woman lying poolside reading a magazine who glances up as you walk by. I felt obligated to wave. We’d started at 3:30 pm, about 6 hours before dark, mostly because we were scared. I was assured boating in Alaska can be a dangerous affair, and though I’m no stranger to the water, neither of us have ever been described as old salts. Nevertheless, we were fortunate the seas were like glass during most of our hunt and my fears were mitigated. Working south, we had been glassing for half an hour when I saw a suspicious black shadow about a mile away, easing up and down the shore. As we closed the distance to half a mile, it abruptly turned and bolted into the forest. We cruised further south and the same thing happened and this time we never got within a mile of the coast. Clearly the authorities of the internet were a little overzealous in their descriptions of black bear hunting. But I was relieved we were seeing bears and they were wild, because the best things in life don’t come easy. 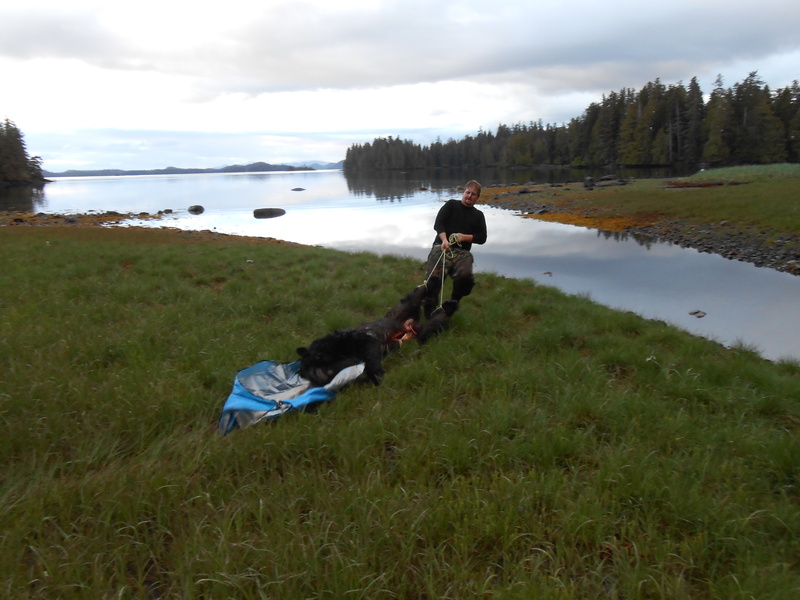 On the following day, we were slowed down by a blown gasket, 14 miles from the boat launch. The engine ran like a 30 year smoker on his fifth flight of stairs wheezing petroleum smoke, but the little Yamaha got us back. As luck would have it, this was one of the days wind picked up a little, making the ride in a bit tense. The tidal shifts in Southeast Alaska are impressive, though tide tables alerted us of the low and high periods. Mountaintops submerged yesterday would be exposed today leading one to imagine scenarios best left dreamt while standing on terra firma. We had two more failed stalks. One because the distance I thought was a quarter mile was actually about a mile and a half, another because I fell on slick rock, spooking my quarry. I might have killed a bear here—if it died laughing at me falling on a rock. The old man’s wisdom was hard to refute. I think there are times that in the adventurous spirit of life young men can forget basic knowledge, making the task at hand much harder than it need be. Despite my strong desire to make it work, spot-and-stalk methods of hunting don’t work well in Texas where properties tend to be small, and hunting areas private, and men get more defensive about trespassing than if you make eyes at their wives and daughters. We ambush our game—hogs, whitetail, and exotic deer mostly—by overlooking a likely area based on trails, forage, and patterns in the landscape, and those ugly barrels and pipe known as automatic feeders. So with a new plan in mind (really my old tactic, just used a few thousand miles northwest), we hid the Lund Skiff on the backside of a small jut of land and walked to the south side of the rock strewn peninsula, bull kelp popping under our boots. A green meadow radiated from both sides of the small creek as it ran parallel to the tree line on our isthmus. About 120 yards inland, the creek and meadow turned abruptly south behind a wall of spruce and red cedar continuing for close to a half mile. I intended to hunt back there. Dad would make a stand back at the ocean’s edge hidden under a spruce. 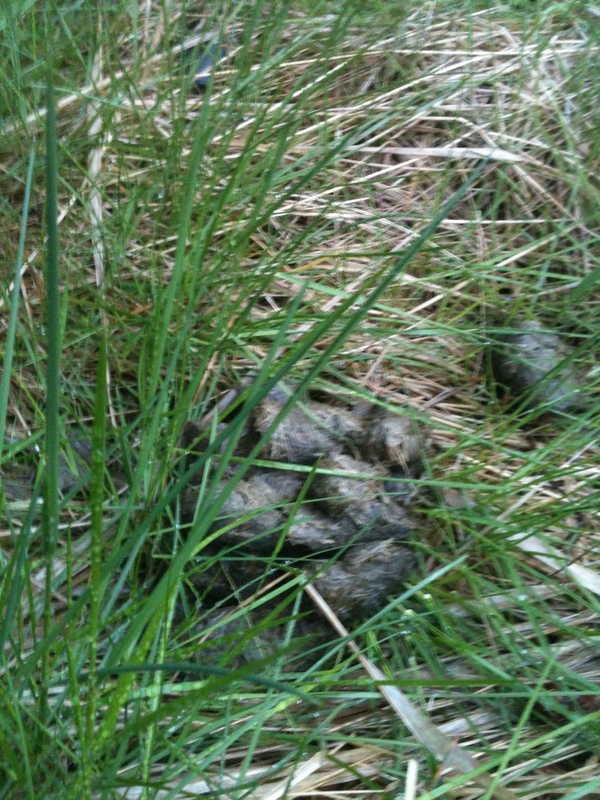 There were trails criss-crossing the muskeg and big green poop was everywhere. This was bear country. To avoid the salt spray wreaking havoc on the metal parts of our guns, we rode with them in their soft cases across the aluminum seats. Back at the boat, after removing our guns from the scabbards, Dad noticed his scope moving as he walked. Apparently, the constant vibration of the aluminum skiff had worked the screws loose on his scope mount. With a flurry of expletive peppered-epithets and lamentations, Dad realized he wouldn’t shoot anything this night. Unfortunately, this isn’t the first gun issue my family has encountered. Starting with my grandfather, who while elk hunting shot a fantastic animal, only to realize while tracking it that he’d fired the only bullet he’d brought with him from Texas. Luckily the elk was down for the count. More recently, my father was with me in New Mexico and had a possible record book mule deer in his scope when he discovered a fatal problem with the firing pin. He pulled the trigger and there was no boom. His hip being what it was, we elected to make our stand together under the towering spruce whose overhanging limbs provided roof-like conditions, while moss carpeted the ground and the fallen logs both behind and in front of us. Sometime in the distant past, huge trees had fallen on both sides of the present evergreen we were under, making a narrow ‘U’. We sat under the tree with our backs facing the sea, just south of the Dasani Islands. The moss-covered logs behind and in front of us offered perfect padding both for my rifle and our backs. I’d like to tell you it was a grueling place where we sat, only our sheer grit allowing us to grind through a difficult hunt, but honestly it was, without a doubt, the most comfortable stand location I’ve ever experienced. 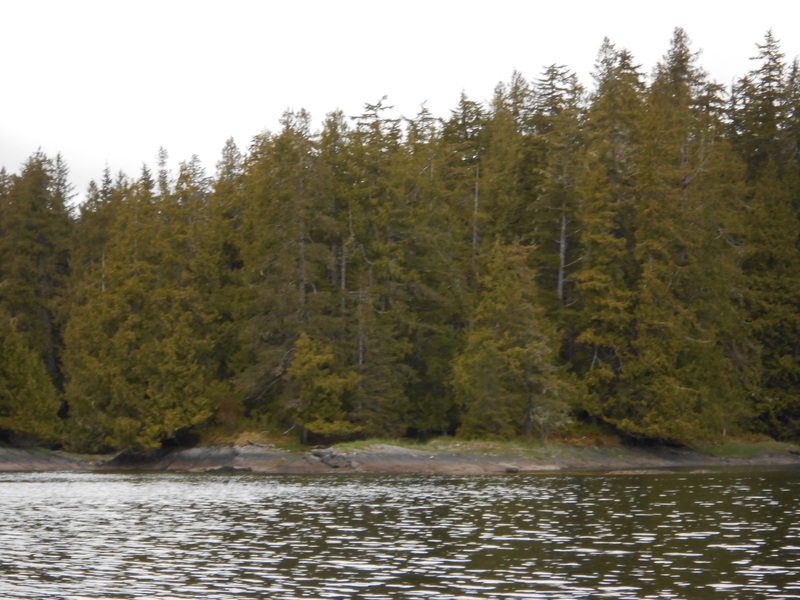 We sat on the south side of narrow forest-covered peninsula about 40 yards from the mouth of the creek. Facing east, we could see the creek and accompanying meadows until the stream bent south behind the island of forest. The edge of the trees where the stream disappeared was 93 yards according to my rangefinder, and about at the 1:00 o’clock position from our station. We were settled and quiet by 6:30 pm. Where I was daydreaming when a big bear appeared. A childhood friend’s father once related the story of how after he quit lusting after a big mule deer, one appeared and he killed it. As a middle school boy, I often read the accounts of safaris taken by rich oil and cattle men in the 1920s, and in one the author discussed the importance of thinking about anything but the game you are after while hunting. I’ve found this to be more or less true. Rain was gently falling when a lonely pair of Canada geese dropped from the sky a couple hundred feet away from us in the water to our right. The wind was blowing our scent across the water, but of course geese can’t smell or don’t care about my particular aroma. Peace quickly settled in as our Thermacell faintly hummed to keep the mosquitos and flies at bay. At 6:45 a blacktail doe emerged from the forest with glowing brown fur so bright it was almost uncomfortable to my eyes. Her belly was swollen and she would soon be having a fawn. Or perhaps two. Lowering my binoculars, I scanned the grass flat before us desperately looking for a large black mass as I simultaneously raised my rifle to the natural rest before me. My eyes finally rested on the round, dark mass sniffing the ground where the doe had entered the forest in front of me. Two more steps and it would disappear into the woods. Daylight could not be seen beneath its legs and the ears were barely discernible on the sides of his round head. Small, immature bears will be leggy, angular creatures with ears placed atop narrow triangle shaped heads. They look skinny and fast. This bear, pausing momentarily to sniff the trail where the doe entered the forest, was muscular and round, exuding robustness and power. My Nikon scope was zeroed at 100 yards, and I placed the crosshairs just behind the front shoulder, exhaled and sent 180 grains of Nosler Partition through its heart and lungs. What seemed like forever actually took less than 2 seconds. Spinning, he turned and rounded the corner in a lumbering fury of brute force. 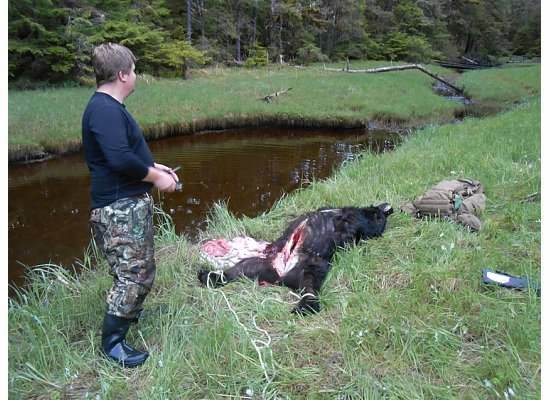 From the ancient Finns and Japanese to the Algonquin and strange tribes in Siberia, first peoples separated by oceans, mountain ranges and river systems have similar rites concerning the hunting and killing of bears. Often seen as metaphysical links to the spiritual world, each group in various ways, apologize, thank and explain to the bear why he was necessary to kill. After hearing the guttural moan exclaimed by this bruin, I’d be hard pressed to deny the emotional impact it manufactured. This is the paradox facing every hunter who simultaneously loves the animal he pursues, but at the same time recognizes his own position as the preeminent predator. This bear would feed my family meals of pozole, chile, chicken fried steak and tamales. It would take an honored place in my living room until the day I die. Meanwhile, it had been less than five minutes and my Dad had the enthusiasm of my six-year-old and almost as little restraint. After five minutes of heated debate, I reluctantly agreed to ease up to the bend and see if there was blood and if it had dropped. A bullet in my chamber, I crept slowly across the muskeg with my eyes up until I reached the point where the bruin stood when I took the shot. I didn’t want to spook the bear and have him run into the woods. My heart sank as I walked circles without seeing a drop of blood. I soon gave up my search for blood and started up the creek. I checked, and my scope was secure as the day I mounted it. The lack of blood worried me and I berated myself for rushing my shot. But my dismay soon turned to elation. I’d gotten my bear. There it was: spread eagle in the foulest water on the whole island. Oils emitted from decaying grasses in the tributary looked like gas spilled in a puddle at your local convenience store. Orange brown mud would cloud and swirl in the water with each of my steps, sucking at my rubber boots and threatening to pull them from my feet or pull me to my knees. Strange sulfurous smells would escape from beneath my boots with each step, making me a bit lightheaded. After a prayer to our Maker thanking Him for the experience, the work began. 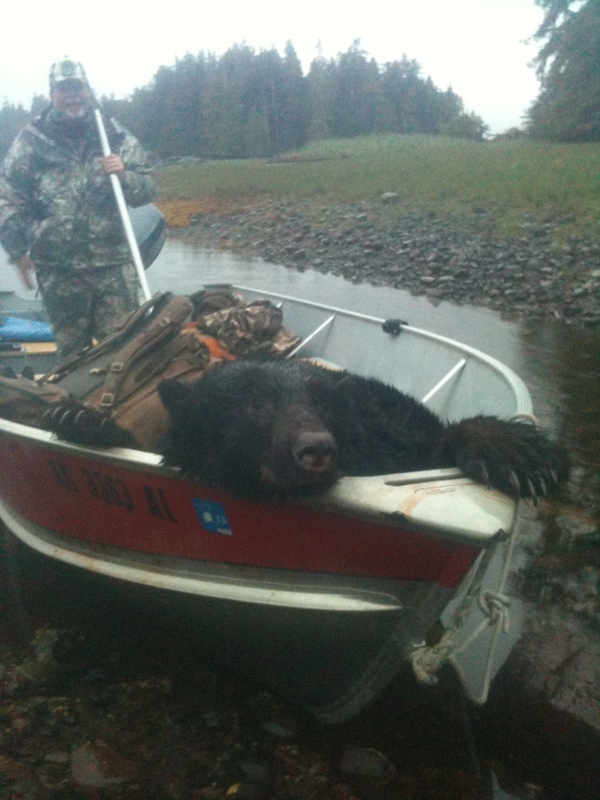 Two hours were spent getting the bear out of the water, gutting and loading him into the skiff. Cool weather allowed me to skin and process him the next morning. We had a 20 minute ride back to the boat launch and just that amount of daylight to guide us through the maze of mountain tops and boulders. 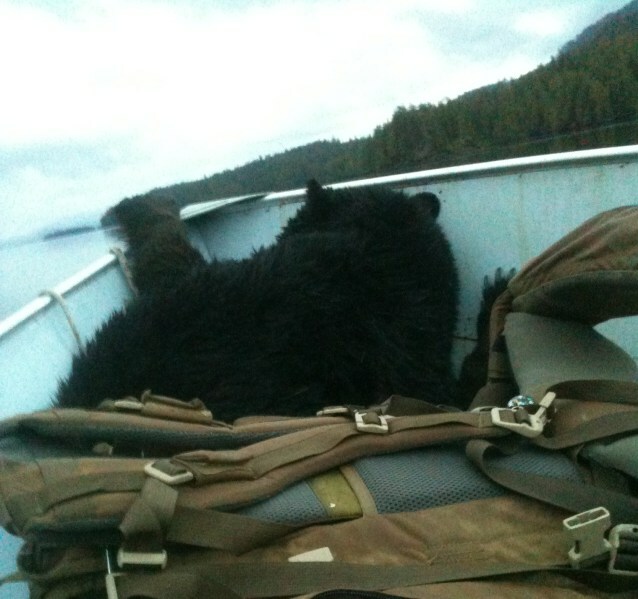 The next morning we took the bear to be “sealed” by a fish and wildlife official. 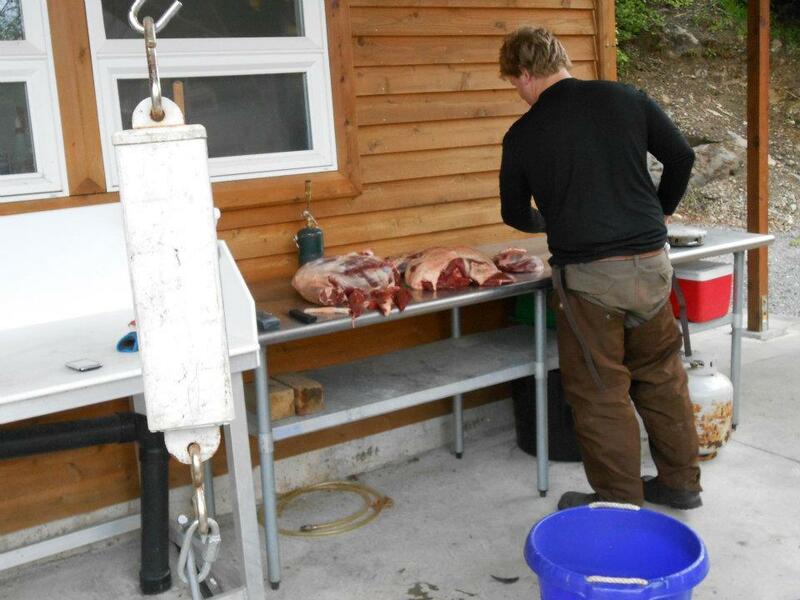 Rosie was a rugged Alaskan and veritable fountain of knowledge and showed me how to properly measure and age a bear. Estimated to be 9.5 years, he measured 6’4″ squared with a 20 and 4/16 inch skull, and was estimated to be around 300-350 pounds. I was glad to have taken a mature boar. The work about to begin. Getting the hips over was the hard part, pulling the shoulders and head was easy. I didn’t want to damage the cape of my bear, so I tried to drag it out on a tarp. Really, the tarp didn’t work and wasn’t necessary. Originally, I was going to quarter it on location, but with darkness coming and a long boat ride in, I decided to bring it in for butchering. Our skiff was on the other side of the green knoll on the right. Getting it sealed. Rosie was a cool guy. “Don’t stretch it so tight you can read the paper through it! 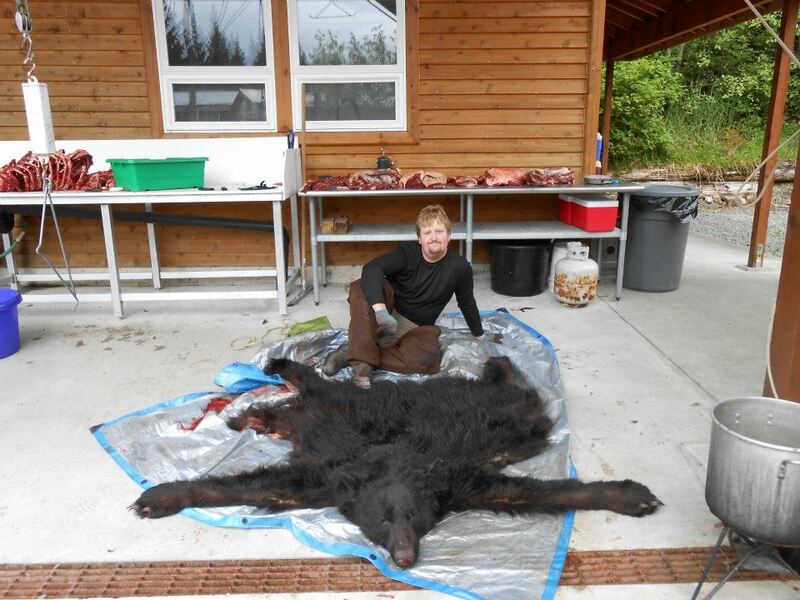 Alaska Fish and Game requires you to have your bear “sealed” and Rosie above is their local man. 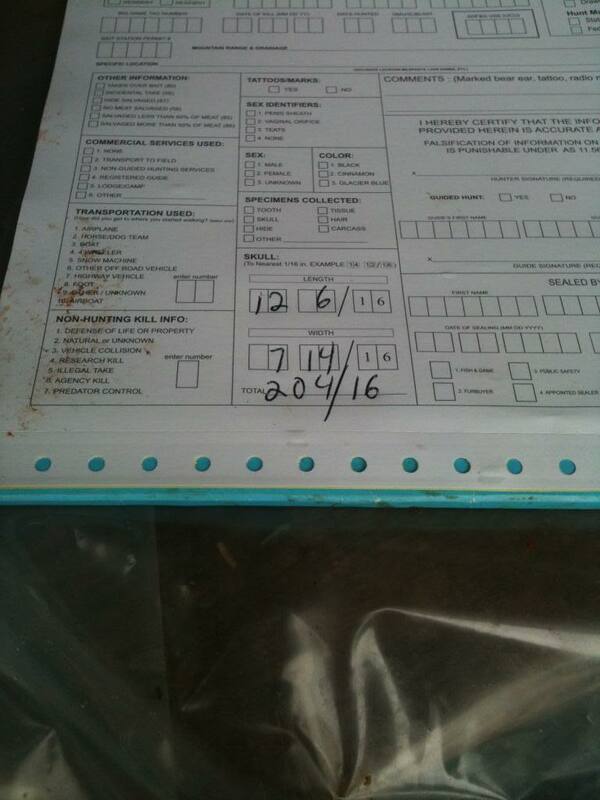 They measure the skull to determine maturity as well as take a back tooth. He estimated the bear to be 10-11 years old. The most rewarding trophy, I brought back just shy of 150 pounds of meat. That night, we marinated a bear shank in carrots, onions, celery, and a Coca Cola; then roasted it with some potatoes. Seasoned with eight months of planning, good luck and hard fought opportunity we agreed it was one of the finer meals of our lives. Andy Spencer is a father of three boys who leads adventures despite having a seminormal career and family life. He has hunted bears in Alaska, hiked portions of the Continental Divide Trail, the Appalachian Trail, and the Pacific Crest trail; as well as kayaked oceans, bays, lakes and rivers in pursuit of fish. He focuses most of his efforts raising his sons to pursue life with similar gusto, emphasizing a lack of timidity and love of God. He was born in Abilene, Texas. You can read more of his writing at andrewospencer.com. This article originally appears there and is reprinted here with permission. Got to spend 10 days on POW island. Saw more bears, bald eagles and salmon than I had my whole life. “Shasta Mountain”!!! That would be Mount Shasta. The great Mystic Mountain itself, headwaters of the Sacramento River, holy to Indians and spiritualists alike. And a pretty impressive sight. Please get it right. And, once upon a time, to hippies. It’s spelled with a T, not a D.
There’s a ‘t’ there, isn’t that good enough? Or did you mean two? ‘An’ implies one, and that it has. The island is teeming with them. Plenty food pressure, suh. Libtards don’t like it when shoot their kind. Very cool experience, and even more so because you did it with your dad. Bill doing it with my Dad was awesome. Shared experiences are best in my books. Awesome story. Makes me want to go there with my camera. Reminds me that I need to get on with the hunters safety course and get my license. Not that I’ll start with bear, of course. I just finished my course and got my license. First in 40 years and like the author’s father i’m being coaxed back into hunting by my son. First hunt will not be for bear. Cool. I dont’ know if it’s for me yet, but I wont’ knock it until I’ve tried it. I have a buddy who goes pig hunting, so I’m eager to join him and try out my rifle outside of a range. That was pretty fantastic reading. It’s not very often I sit still to read something that long that’s not an actual book, even at 750+ words/minute. I don’t know about you, but this was certainly not a speed red kind of story. You sort of have to sit back and digest it. Enjoy the photos and add one more thing to your bucket list! Alaska is a fantastic place. It can be unforgiving and magical all at the same time. I think that is what draws us there. An earthly power force calling to our inner selves. Awesome story, I hope to get the chance to hunt some big predators at some point myself. That said, my inner grammar nazi requires me to correct you on one small point. They’re Canada geese, not Canadian geese, birds do not get citizenship. Noted. I already caught that, along with Mount Shasta noted above, and a few other things, but I’m waiting to find out if I’m allowed to edit it, since this is a republish from elsewhere. The rules get funny around things like that. There were a number of usage and grammar oddities. I thought it just made the write-up seem casual, not over-edited. I enjoyed the memoir of the hunt very much. And what luck that he got his dad out there in time. The report was interesting, unpretentious, and a pleasant change of pace from NYT Moms Demand Illegal Mayors. Fine story. Thank you Andy. I’m not a hunter, but tales like this tell me there is a sublime experience in it that I’ve missed, at least since Boy Scouts. I’d do it…that bear shank stew sounds yummy! Used to read those kind of stories as a kid (I’m 61).
. . . waiting on Al Sharpton and Jesse Jackson to ask why it had to be a Black Bear?? Just kidding – great story. Would love to take my little girls hunting like this one day . . .
You are forgetting the massive polar bear. You never been to west Holywood have you? This give me some ideas. My dad will probably retire in 4-5 years. An Alaskan hunt would be an awesome trip to take him on. 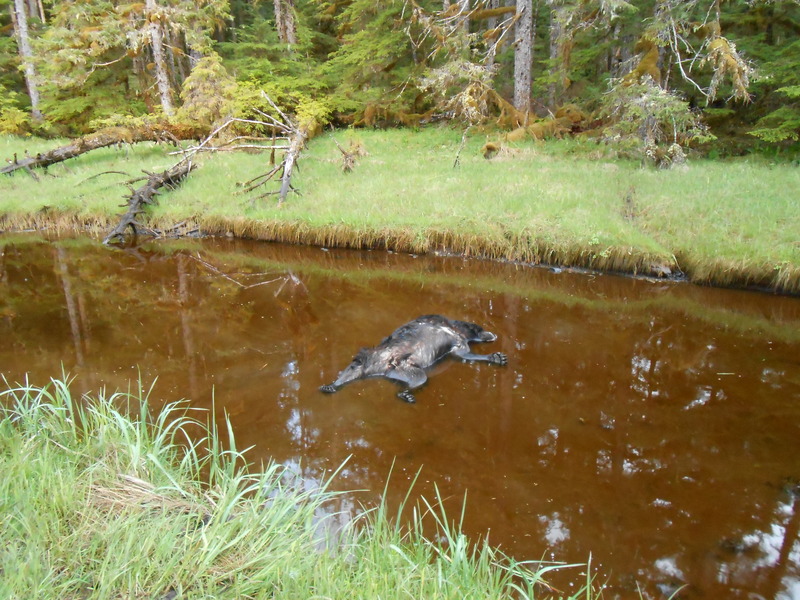 I’ve always dreamed about an Alaska hunt and I am sure he would love to go too. He would probably want to do some fishing since he is an obsessive salmon fisherman during the summer. Great story. I am inspired. Must… Go… Hunting again. Andy, thanks for the great story. You really put some work into the story, and it shows. This hunting story was a whole lot more interesting than the early post containing the video of a guy shooting an Elephant hand picked for him, watching a guy set up his rifle rest, and then he and a couple other guys helping him shoot it five times. Agree, Paul. A drive-up elephant shooting in which three different parties fire, and fire not because of a charging elephant, but because they couldn’t be bothered to seek in the first place a suitable bull adequately isolated, turned my stomach. The PH and junior were terrified that the bull was going to get away wounded, and rightly so. The comments of the client at the end didn’t improve the thing. 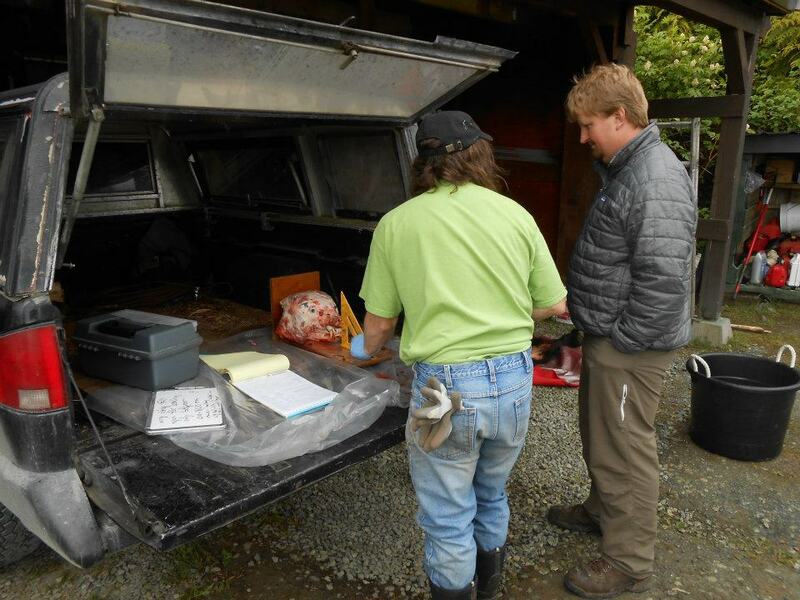 What does bear meat taste like? Now, is it like beef? Bison? …. Depends on the time of year and what their diet consists of. It tends to be more like a roast type meat in consistency. It tastes a lot like beef. But with the local flavor. Hard to beat fall bear that’s been gorging on blackberries. The fat, rendered to lard, makes for some of the best pie dough you will ever experience. Tom is right. Beef is the closest in texture, muscle striations, etc. A Californian bear we ate was the best game I’ve had. You could tell my bear had been eating salmon. I dream of a blueberry bear hunt in the future. Amazing story. I’m not much of a hunter, I prefer to shoot my guns at paper and steel. I love to fish and hike though, and your love for the outdoors really came through in your writing. My day was made much better for having read this. Excellently written. I felt like I was a long on the hunt. Great thing to share with your Dad. Thanks for your story. Great story. Thanks for sharing with us. Wow. Cool. I’m impressed by your hunting and your respect for nature. Well done. Fellas I’m glad you enjoyed my story. It was a fine time and I hope it inspires you to go on a hunting adventure. Are you implying some part of it wasn’t true? I didn’t get that. In any case, though it may have been too long for some of our readers, I thoroughly enjoyed it as a nice change of pace. Variety being the spice of life and all that. All jokes aside I can’t wait til me and my father make it out for some rugged predator hunting. Thanks for the story.